Working away at the CBF event. 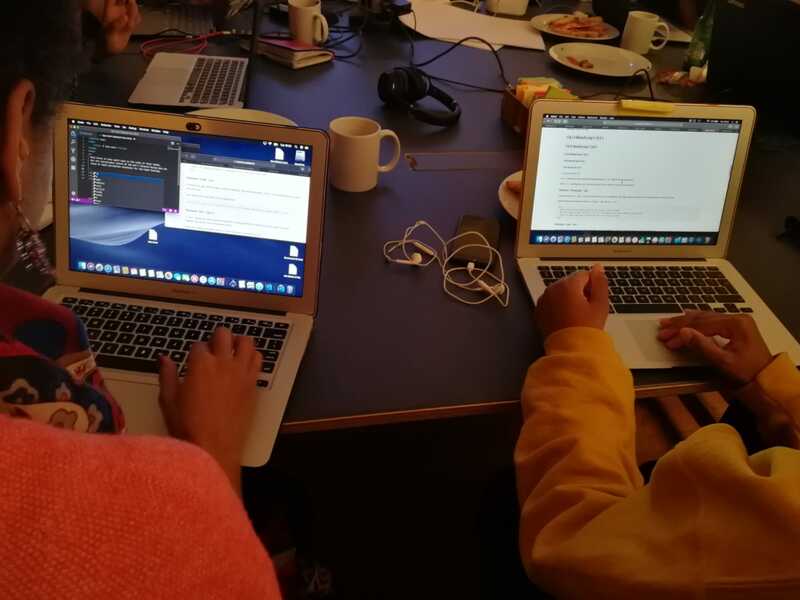 Earlier this month dxw digital started sponsoring Coding Black Females (CBF). CBF is a meetup for black women who are interested in learning to code and those who already work in the tech industry and want to help others. The idea behind the meet-ups is to give people a chance to learn and practice new skills, and to build a network of like-minded women who can support each other, share experience and opportunities. We meet twice a month after work 6-8pm, alternating between dxw digital and WeWork, always with plenty of notice. At the last meeting, we divided the attendees into 2 groups. One for those who wanted to learn coding by following the Codebar tutorial on HTML/CSS, with help from more experienced coders. Another who worked on the CBF website, where half of us researched a bootstrap theme to use on the site and the rest reviewed a logo design. Charlene (the founder of CBF) had already been liaising with a designer on the logo, so we voted on which design ideas we liked and sent feedback to the designer. We’re looking forward to adding personality to our website and I’ll be managing the Twitter account. The space and refreshments were appreciated by everyone, and we’re looking forward to the next event at dxw digital on Wednesday 10th April. Please get in touch if you’d like to come along via DM to @codingblackfems. We plan to have speakers for the first 30 mins of our meetups in future. Topics are yet to be determined, but if you’d like to suggest something, please feel free. The post Coding Black Females appeared first on dxw digital.